For larger injuries where a plaster won't do, use the Masterchef Blue Finger Dressings with Bandage to attend to catering related casualties. With a bright blue design, the Masterchef Finger Dressings are immediately visible should they compromise your food. The finger dressing is designed in such a simple way that it is possible for the injured person to dress their own finger when tending to a wound, without the help of a medical professional. The low adherent pad is attached to a large, soft bandage that wraps around fingers with ease. The simple and highly effective No.7 dressings are suitable to use in all catering and kitchen environments, meeting all the requirements set out by the Food Safety Act (1990). The end of each bandage features a small, peelable tab that exposes a sticky patch for sticking the end of the bandage in place. 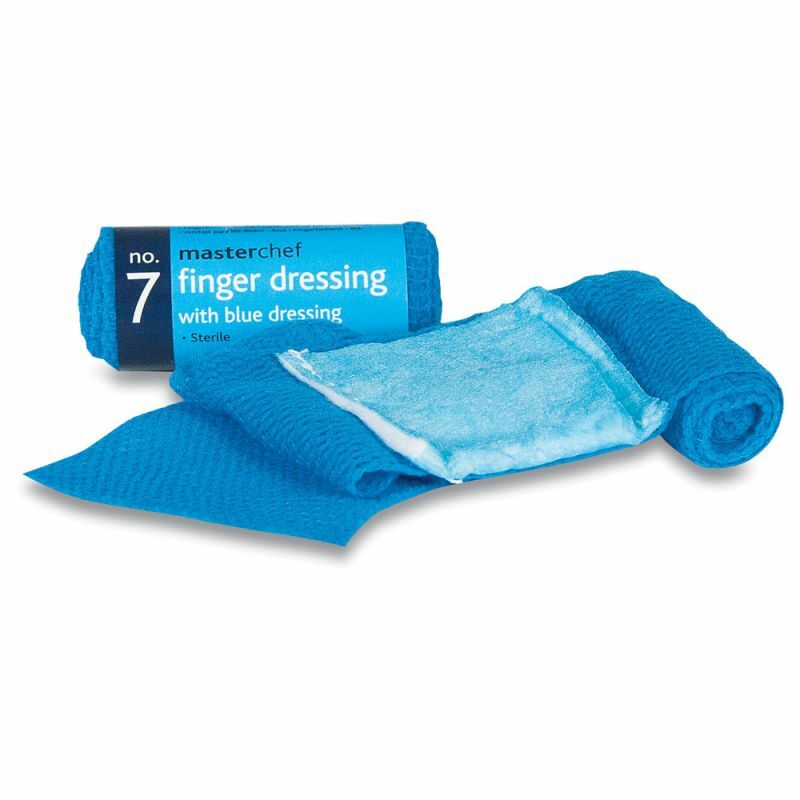 Each Blue Finger Dressing come individually wrapped in strong flow packaging, with a sterility expiry date printed on the pack to ensure that your first aid kit remains well stocked and in date. Use it as a useful replacement for your current HSE approved materials. The Masterchef Blue Finger Dressings with Bandage are usually dispatched via First Class Royal Mail and delivery should be within 1 to 3 working days.